The Palmetto Course at Myrtlewood Golf Club is conveniently located in the heart of Myrtle Beach and it offers a great Myrtle Beach golf experience. The Edmund Ault golf course design is a very player friendly course that offers something for everyone. Opening in 1972, the Palmetto Course has been a favorite among locals and tourists alike since. The Palmetto Course has wide, generous fairways that offer a very good scoring opportunity. From the back tees the course stretches to almost 7,000 yards which can make it a challenge for even the most skilled players. The 18th-hole has been named one of the best holes on the Grand Strand and it offers a beautiful backdrop of the Intracoastal Waterway. The Palmetto Course has a beautiful full-service clubhouse and a large practice facility. 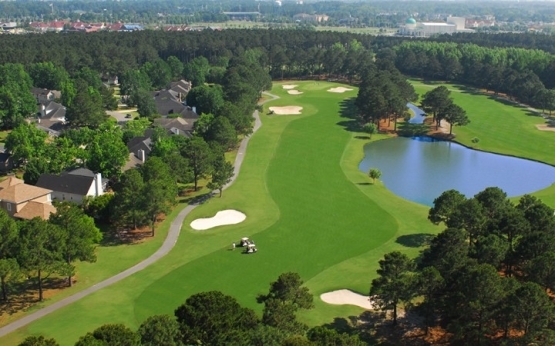 Because of its central location, the Palmetto Course gives golfers a great opportunity to enjoy the many Myrtle Beach attractions that are located at Broadway at the Beach, such as Jimmy Buffet’s Margaritaville and Crocodile Rocks. Broadway at the Beach offers a huge selection of specialty stores for a fantastic Myrtle Beach shopping experience. Enjoy the mild Myrtle Beach weather as you stroll the many stores and Myrtle Beach restaurants. Myrtle Beach has something for everyone. It is time to book your next Myrtle Beach golf package today!